Taking pictures of children requires many things. You have to establish a positive connection with them. If they are feeling uncomfortable the pictures won’t be any good. Then it’s patience and of course a little bit of luck to get good shots, because children won’t follow your commands as a professional model would do. The image you can see above was taken in my studio. The little lady is very happy and has a lot of fun with the buggy I put her into. One has to goof around a lot when dealing with children. This particular child was very excited with me making strange noises behind the camera. If I try to write out my blabbering it could sound like this: “Buggabaggadoodidoodi-blbfrt blbft – agu ! agu ! Ooooooooiiiiiiioooooouuuuu….” This is what caught her attention and made her laugh. Note that every child is different but making strange noises usually works (sometimes even with grown-ups). 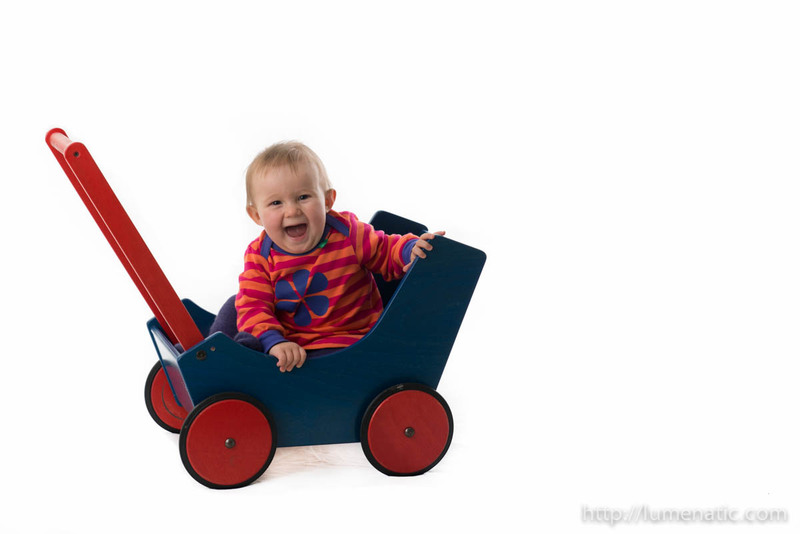 The left softbox illuminates the child in the cart. The Speedlight and the right softbox illumninate the background. The background flashes are necessary to make the white cloth I use appear completely white. In retrospective I also could have used both studio flashes to illuminate the background and use the Speedlight for the child. This way the background illuminaten would have been more even and spared me some time in Photoshop. This is actually the most intensive part in post processing for me when working on such shots. I spend most of the time on making the white being white. The kinks and wrinkles in the cloth cast shadows and fixing this is what eats up the time. What I will also try in the future is to use more white cloth and place the model further away from the background. This way the illumination of the model and the background can be separated in a more precise way than with the current setup. But as you can see above the shot came out very well and it was great fun doing this session. To close this post I will show you another picture from that series. The setup gave you nice results! They are superb!